Transform your home into a medieval castle, pirate ship, or a sanctuary of gothic style with our banners and pennants. This category includes our medieval banners and standards, gothic flags, and pirate flags. Dress up the walls of your living room, bedroom, or office with these unique home decor pieces or use them to add authenticity to the setting of your next special event! Our medieval banners and pennants are offered in a variety of colors. Many have their designs carefully silk-screened onto high quality fabric, and feature famous heraldry of the Middle Ages. 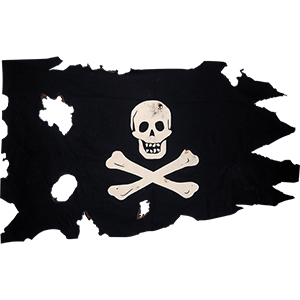 Shop our pirate flags and you will find flags based on those actually used by pirates of the Golden Age of Piracy, some pristine and others weathered for a suitably antiqued look. Our gothic flags feature dragons, skulls, grim reapers, fallen angels, and more that will add a touch of dark fantasy to any space. When it comes to medieval, gothic, and pirate banners and flags, this section has it all! We are proud to offer you our selection of medieval banners and standards. Many of our medieval castle banners, standards, and pennants are handcrafted or have their incredible designs silk-screened by hand. Shop medieval castle pennants and other heraldry banners here as well as canvas standards for jousting and adding authenticity to reenactment displays, theater stages, and Renaissance fair settings. 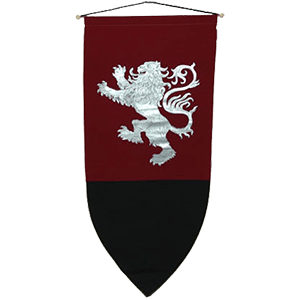 If you want to add some medieval castle style to your own home, you can do it with our great selection of medieval banners and standards here. We offer an incredible variety of colors and designs as well, including dragon banners, Celtic pennants, griffin banners, rampant lion banners, Templar knight banners, and more. We carry a variety of gothic flags at affordable prices. We carry dragon flags, skull flags, Grim Reaper flags, Pentagram flags, and more. Many of these gothic flags are a massive 29 inches wide by 42 inches high. Most are full color poster flags made from lightweight polyester and can be used for indoor or outdoor purposes. These gothic flags can be hung as posters or flown as a flags in offices, bedrooms or any wall in the home. 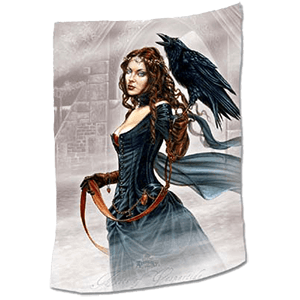 Our gothic flags make great gifts for that special person who is interested in the beauty of dark fantasy. During the Golden Age of Piracy, pirate ships used a number of distinctive flags that they would raise once they had another ship within firing distance, offering their prey a chance to surrender rather than risk fighting with no quarter. Here we offer a selection of excellent pirate flags used by some of the most infamous pirates in history like Calico Jack and Henry Avery, as well as the iconic Jolly Roger flag. These skull and crossbones flags, along with our other designs, often show off burn marks and other stylized wear and tear to give them a realistic look. Our buccaneer flags come in a range of different sizes, allowing you to choose the one that best suits the space you have in which to hang it. Some of our swashbuckler flags have been treated with a waterproofing agent to prolong their life when displayed outdoors. Many of our pirate ship flags feature grommets for ease of hanging, as well. Fans of Black Bart, Blackbeard, and other notables are sure to appreciate the bold look of these excellent canvas flags!